Technician working on carbon fiber for automotive application. Cure Monitoring of Sheet Molding Compound (SMC): The curing behavior of Sheet Molding Compound (SMC) was observed using the LT-451 Dielectric Cure Monitor. Bulk Molding Compound (BMC) is the generally the same material as SMC but in bulk form, so the analysis of results apply to BMC as well. Cure Monitoring of Bulk Molding Compound (BMC): The curing behavior of Bulk Molding Compound (BMC) was observed using the LTF‑631 High Speed Dielectric Cure Monitor. Bulk Molding Compound is generally the same material as Sheet Molding Compound (SMC) but in bulk form, so the analysis of results can apply to SMC as well. The data from dielectric cure monitoring (DEA) clearly show how Critical Points identify features of the cure and enable quantitative comparison of cures under different process temperatures. (2) Cure time decreases as cure temperature increases, as expected for a reaction that is thermally driven. Cure Monitoring of Near-UV Cured Gel Nail Polish: Lambient Technologies tested the base gel for a nail polish system that requires near-ultraviolet light to cure. Cure Monitoring of Polyurethane: Lambient Technologies studied room temperature cures of a polyurethane resin with three different catalysts. An LT-451 Dielectric Cure Monitor made measurements during each test at excitation frequencies from 0.1 Hz to 100 kHz for 24 to 36 hours. Cure Monitoring of Epi-Kote MGS LR135 Epoxy: Lambient Technologies tested Epi-Kote MGS LR 135 resin cured with Epi‑Kure MGS LN 134 catalyst at 55 °C, 70 °C and 85 °C to observe the effect of process temperature on cure rate. 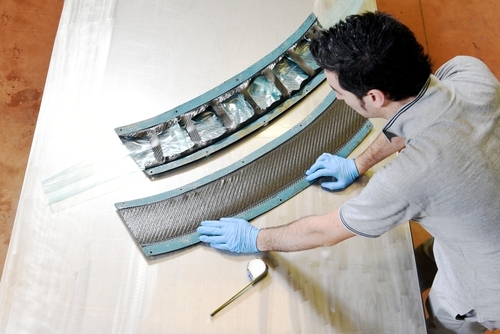 Epoxies in the Epi-Kote product family are widely used in the fabrication of wind turbine blades, often using the process of resin transfer molding with fiberglass reinforcement. The data from dielectric cure monitoring clearly show cure time decreases as cure temperature increases, as expected for a reaction that is thermally driven. Cure Index Analysis of Five-Minute Epoxy: Lambient Technologies tested a generic “Five-Minute Epoxy” to observe the effect of different thermal conditions on the progress of cure. For isothermal tests, ion viscosity measurements easily reveal cure state because temperature is not a variable; however, five-minute epoxy can generate a significant exotherm, making the typical reaction non-isothermal. In this case, because ion viscosity depends on both cure state and temperature, reaction rate and degree of cure are not clear when analyzing ion viscosity alone. With Cure Index analysis, which accounts for the effect of temperature, dielectric measurements clearly show how cure time decreases and how degree of cure increases with greater peak exotherms, as expected for thermally driven reactions. Acrylic Adhesive Cure: Lambient Technologies tested samples of a commercially available two-part acrylic structural adhesive with the LT-451 Dielectric Cure Monitor.